From 3 to 7 October, the international motorcycle industry presented itself with new products and trends at the INTERMOT 2018 motorcycle trade fair in Cologne. With 220,000 visitors, just as many motorcycle enthusiasts flocked to INTERMOT this year as in the record year 2016. And this despite the fact that many manufacturers were very reluctant to present genuine innovations at the latest edition of the trade fair. All the more reason to pay tribute to the attractive concept of the fair, which convinces with modern presentation forms. The test drives with the latest machines were well received by the public. Even those interested who do not yet have a driving licence were able to get close to the motorbike experience. INTERMOT Customized has developed into a real crowd-puller. Particularly pleasing is the fact that this special show – which covers an entire exhibition hall – is particularly well received by young visitors and thus makes an important contribution to familiarising younger people with the world of motorcycling. Another focus of INTERMOT 2018 was the wide field of motorcycle travel. On the Boulevard of Touring, a large selection of the latest touring machines was exhibited. 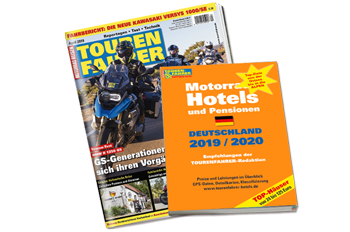 Integrated into the Boulevard of Touring was the TOURENFAHRER stage, where renowned speakers reported on their motorcycle tours. Between the multimedia shows there were free workshops on numerous motorcycle travel topics. INTERMOT 2018 was attended by 1,041 companies from 40 countries, 66 percent of them from abroad. The trade fair organiser estimates that around 220,000 buyers and visitors from almost 100 countries attended INTERMOT 2018. The proportion of trade visitors was around 24 percent, with 35 percent coming from abroad. INTERMOT 2018 occupied a gross exhibition area of approx. 180,000 m², of which approx. 68,000 m² were open-air grounds used for the implementation of the supporting programme. The meeting place for female bikers – Ladies@intermot – which was realised for the first time was also well received. The specially tailored programme led interested female bikers on trade fair tours to motorcycles and clothing suppliers who had developed special products for women, and also provided information on current offers of tours, safety, technology and sport for female motorcyclists. It is estimated that the proportion of women visitors to INTERMOT will increase from 18 to almost 22 percentage points compared to 2016. In addition to customizing and touring, the focus was on electric mobility and the networking of vehicles. Acrobatic shows, competitions, races and last but not least a motorcycle church service provided an exciting and atmospheric supporting programme for INTERMOT 2018.